Top left: Advertial for Louis Adler's 530 and 550 Seventh Avenue. Women's Wear Daily, October 11, 1929. Courtesy of Center for Research Libraries, Chicago, Illinois. Top right: Advertisement for Abraham Bricken's Bricken Textile Building, 1441 Broadway. Women's Wear Daily, October 11, 1929. Courtesy of Center for Research Libraries, Chicago, Illinois. 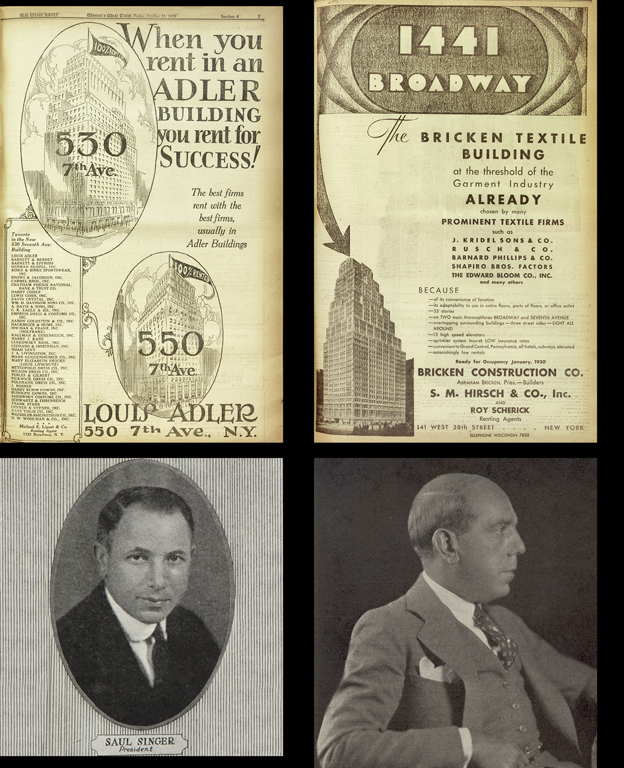 Bottom left: Saul Singer, one of the builders of the Garment Center Capitol. American Cloak and Suit Review, June 1921. Fashion Institute of Technology. Bottom right: Abraham Lefcourt. Building Investment and Maintenance, June 1927. Courtesy of Avery Architectural and Fine Arts Library, Columbia University in the City of New York. The success of the Garment Center Capitol and other early loft buildings resulted in a wave of speculative investment. Between 1919 and 1931, builders purchased property, demolished old buildings, commissioned designs from architects, and contracted for the construction of approximately 130 new high-rise factory and showroom lofts. Some of these developers were small-time investors, involved with one or two buildings, but some-Louis Adler, Max Aronson, Abraham Bricken, Mac Kanner, and especially Abraham Lefcourt-developed multiple sites in the area. All shared a similar rags-to-riches story: they were poor Jewish immigrants or the children of immigrants, who had grown up on the Lower East Side, worked in sweatshops, opened successful garment factories, then moved into speculative building, eventually closing their factories to focus on real estate development. These developers selected architects from similar backgrounds. A handful of firms were primarily responsible for the majority of garment lofts. Schwartz & Gross, George & Edward Blum, Gronenberg & Leuchtag, Sugarman & Berger, Charles Meyers, and Henry Oser all specialized in speculative buildings, designing both lofts and the apartment houses that were being erected by the dozens on the Upper West Side of Manhattan, in Brooklyn, and throughout the city. The best-known architect active in the district was Ely Jacques Kahn, the well-educated son of affluent German-Jewish immigrants. Kahn designed some of the most impressive showroom buildings, including the district's most visible and distinctive structure, the 42-story Bricken Casino Building on Broadway and 38th Street, which was originally crowned by interlocking fins that have recently been removed.